New York gold futures on Wednesday hit another fresh record and for a second straight day despite the appearance of a stronger US dollar. Investment demand was the common reported reason for the yellow metal’s rise. Platinum and silver advanced as well while crude oil fell for the first time in three days. US stocks closed mixed, with the Dow falling from a 14-month high. Gold for February delivery rose $12.80, or 1.1 percent, to $1,213.00 an ounce. It ranged from $1,196.50 to $1,218.40 — the new all-time high. January platinum surged $19.70, or 1.3 percent, to $1,506.30 an ounce. It ranged from $1,486.60 to $,1514.80. In PM London bullion, the benchmark gold price was fixed earlier in the day to $1,212.50 an ounce, which was an increase of $20.00 from Tuesday. Silver went up 46 cents to $19.180 an ounce. Platinum was settled at $1,485.00 an ounce, for a gain of $15.00. "Investors aren’t getting paid to have money in cash, so money is finding its way off of the sidelines and into gold and other commodities," Brian Hicks, co-manager of the U.S. Global Investors Global Resources Fund, said on MarketWatch. "Gold will go up, as will other commodities," Mark Mobius, the chairman of Templeton Asset Management Ltd., said in a Bloomberg Television interview today from Hong Kong. "It’s basically the devaluation of currencies, which is ongoing and will be ongoing for many years to come." Crude oil fell "after government data showed U.S. crude inventories rose last week as demand remained weak," wrote Moming Zhou and Polya Lesova of MarketWatch. The Energy Information Administration on Wednesday said petroleum demand fell 2.6 percent to 18.32 million barrels a day. Gasoline inventories increased by 4 million barrels. Crude inventories were up by 2.89 million barrels. "Across the board this is pretty bearish,"Anthony Nunan, an assistant general manager for risk management at Mitsubishi Corp. in Tokyo, was quoted on Bloomberg. "Here we are into the fourth quarter and we aren’t getting any draws in inventories, especially in distillate fuels. It’s just not good for demand." New York crude-oil for January delivery plunged $1.77, or 2.3 percent, to $76.60 a barrel. The national average for regular unleaded gasoline increased two-tenths of a cent to $2.629 a gallon, according to AAA fuel data. The price is seven-tenths of a cent lower than last week, 6.2 cents down from a month back, but 81.7 cents higher than a year ago. The Dow Jones industrial average fell 18.90 points, or 0.18 percent, to 10,452.68. The S&P 500 Index rose 0.38 points, or 0.03 percent, to 1,109.24. The Nasdaq Composite Index advanced 9.22 points, or 0.42 percent, to 2,185.03. Wednesday’s opening market action looked like an instant replay of the last three weeks’ worth of "the trade." Put on your blue coat, pin your trading badge on, go sell USD, buy gold, oil, stocks, and whatever else you can get your hands on. Hey, buddy? It’s that easy? "Oh yeah. An easy day’s work. No fuss, no worries. What could go wrong? Oh, that little sandstorm? Nah, it was just the ‘thin’ conditions over the holiday, and the news was blown out of proportion. Anyway, gotta get back to more speculation, sorry to run off." The following numbers were in play as the big roulette opened for the midweek gambling session: Gold advanced $13.50 to $1209.50 spot bid, silver was up 11 cents on the $19.20 marker, platinum rose $6 to the $1485 spot on the felt, and palladium gained $5 to $386 on the board. Rhodium was unchanged at $2600 per ounce. The words ‘correction’ and "overbought" have now been banned from the trading vocabulary, replaced with nicer-sounding ones, and those who are talking a 20% -25% "clean-out adjustment following frothy conditions" (while noting that no ‘real’ damage would be done to the overall trend) are, well, just talking. Why, unless they warn us that it could all unfold in one or two sessions, they won’t even be noticed, much less heard. Continuing dollar weakness made for one more overnight record – the 21st in 23 days (!) in gold prices – this time near $2018 per ounce. The financial media is-by now-yawning at the prospects of having to write yet another story on the subject of gold price records, having run out of uber-bullish statements from every possible source. Thus, the latest statements one runs across in various articles are no longer just uber-bullish – they have actually turned comedic in nature. No, this is not a Jon Nadler quote. No, it is not a Dennis Gartman quote, either. Or a Ned Schmidt, Nouriel Roubini, Bob Prechter, or Paul Krugman label on the gold market, either. Though they might still be thinking it, despite the thrashing they are taking in certain uber-bull gold quarters for daring to entertain the idea that gold might currently just possibly be inside a floating, thin-film, rainbow-coloured spherical object. This, folks, was pure heresy, and it came our way from a ‘higher’ source. None other than the soon-to-be-winner- of the "new darling" central bank contest of the bullion bulls, China, uttered the "B" word overnight. Just as bullion set new price records near $2018 per ounce. "Gold prices are currently high and markets should be careful of a potential asset bubble forming" a senior official at China’s central bank said on Wednesday, as prices for the precious metal hit a record high. This is the China that is supposed to be getting ready to go on a gold shopping spree that some have estimated to range from 2 to 10 thousand tonnes? "We must keep in mind the long-term effects when considering what to use as our reserves," Hu Xiaolian, a vice-governor at the People’s Bank of China, told reporters in Taipei, when asked if China had plans to increase its gold holding in its foreign exchange reserves. "We must watch out for bubbles forming in certain assets, and be careful in those areas." In so many words, no thanks. Not at this time, certainly not at this price. And, most certainly not, when one considers what such a little shopping spree might do to prices during the process, and what the other side of the mountain might look like when sitting on such a pile and possibly having to sell some tonnage for whatever purpose. And, definitely not, when considering the possible value damage that could be done to the remaining Chinese US dollar reserve holdings- the giant $2 T pile of which would barely be dented in size by a 77 billion dollar purchase of, say, 2,000 tonnes of the shiny stuff. A case of "reverse-replay UK" – where the act of buying or selling the stuff has larger repercussions on the remaining holdings than the value of the entire transaction. "Charles Plosser, the president of the Philadelphia Federal Reserve Bank, became the first top central bank official to call for higher interest rates in this cycle. In a speech on Tuesday, Plosser said the Fed had to start raising interest rates sooner rather than later and had to begin withdrawing excess cash from the financial system. If the Fed does not act soon "the inflation rate is likely to rise to levels that most would consider unacceptable," he warned, reported Marketwatch on Tuesday. Today’s jobs data might only go a small way towards shifting Fed jawboning to manifest Fed action, but it is nevertheless one of the signs for which various officials (including the Treasury’s Mr. Geithner) have been holding out for before revving up the interest rate machinery. Marketwatch observes that: "Private-sector firms in the U.S. eliminated 169,000 jobs in November, according to the ADP employment report released Wednesday. It was the fewest jobs lost since July 2008. The private-sector has shed jobs for 22 months in a row." 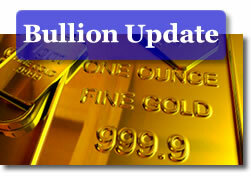 Check out additional market resources at Gold Prices, the Coin Melt Calculator, and the US Inflation Calculator. gold should go up to $2,000.00 or more. then we can talk about correction. if not. there is no need for correction. steady moving up mean gold is very strong. see over $1,350.00 by end of this year. and possible a high at $1,500.00.